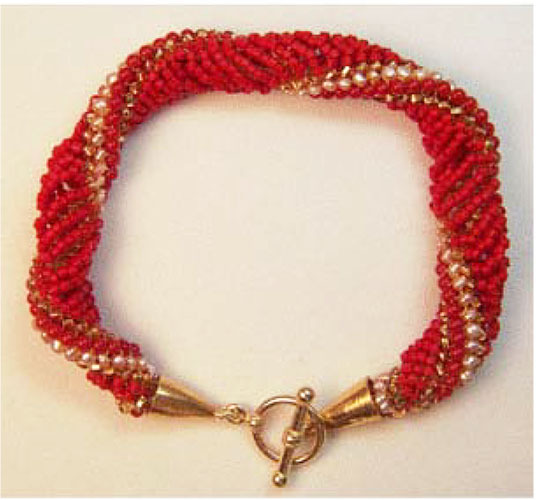 This pattern uses peach pearls, 2mm red coral beads, crystal gold-lined seed beads, and Delica 11/o beads. Pattern directions include step-by-step photos of how to start the spiral and increase beads to obtain the beautiful spiral effect. Closure can be done using clamshell and toggle of choice, or using cones and toggle. Pattern directions include step-by-step photos of how to start the spiral and increase beads to obtain the beautiful spiral effect. 7 inches of beadwork; length can easily be adjusted.